Our Social Prescribing in Secondary Care Pilot in Hackney helped users to improve their wellbeing, health, and social welfare by connecting them with others and the community. The pilot service, which was commissioned by Healthy London Partnership, ran from December 2017 to the end of June 2018 at the Homerton University Hospital. The service provided non-clinical support with Link Workers, emotional support on a variety of personal issues, and facilitated Social Prescriptions to community organisations. Many case referrals involved some combination of social isolation, low confidence, low-level mental health problems, or issues with benefits and housing. Through engaging with Social Prescribing Services like ours people are less likely to reach crisis point, relieving some of the pressures on secondary care. 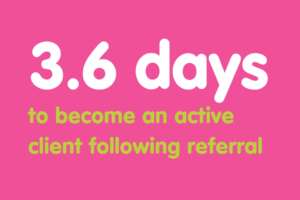 Service users only waited an average of 3.6 days to become an active client following referral. This demonstrates the efficiency of the service that ensures service users don’t face a long wait in receiving support, during the discharge period. Despite the short implementation time of only six months and some ongoing referral issues, the early indications are that Social Prescribing in Secondary Care does achieve positive outcomes for service users and has improved integration of primary and secondary care with community organisations. The service could lead to overall savings for health and social care and is likely to lead to outcomes that will have a wider and higher social value than the cost of delivery. Service users appeared to be feeling more positive about themselves and had reduced attendances at both A&E and GP surgeries. The five biggest outcomes from the programme were service users’ involvement in decisions regarding support, positive new relationships, support relating to physical health, support to manage their own finances, and developing and using coping strategies. Overall, our Social Prescribing pilot has been well received and there was universal support from secondary care staff about our underpinning principles. The service has provided an opportunity to test a service model that supports better use of resources in acute care and provides more appropriate support for a wide range of people within the hospital setting. This suggests that, Social Prescribing in Secondary Care is a model that could have significant, long-term, benefits in the future – given additional implementation and delivery time. In order for the service to offer the most value, further work still needs to be done to differentiate this service from other referral options currently available. Through developing a clear and simple referral pathway, senior and secondary care staff can support and promote the service across various clinical teams. Although, despite referral and systems challenges individuals interviewed felt ‘there was an urgent and immediate need to find new and innovative ways of reducing unnecessary pressure on the secondary care sector’ while at the same helping people gain access to more appropriate forms of support that would prevent future issues arising. A Social Prescribing service was considered to be one of the best ways to achieve this, as these services have proved to be very encouraging and supportive, with the wellbeing value suggestive of being far greater than the cost delivery already assigned. Our Social Prescribing services aim to provide practical and emotional support for service users, reaching out to those in need to strengthen both the secondary care systems and improve the quality of life for people. If you want to find out more about the impact we have, look here.